Durastill 8 Gallons per Day, Automatic Water Distiller with 10 Gallon Reserve tank. This model has casters and level gauge. Connects easily to any source water line for automatic filling. This Durastill 3040 automatically turns on and off to replenish reserve tank as necessary. Made in USA. Overall Height: 39 inches, (Water Distiller with Storage Tank attached) - Allow 3" additional for ventilation, 42" min. total. Note: The overall height is 39”, plus another 1 1/2” for boiler lid handle. The distance from the faucet to the floor is 13 1/2". 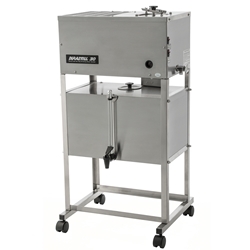 The specs above are based on the distiller and stand separately, but when they are attached, the legs are removed from the automatic distiller which brings the overall height to 39”.